Our Social and Recreation department is a thriving vibrant environment which is well utilised by our residents. The department is a hub for socialising within the charity and is run with enthusiasm and passion. 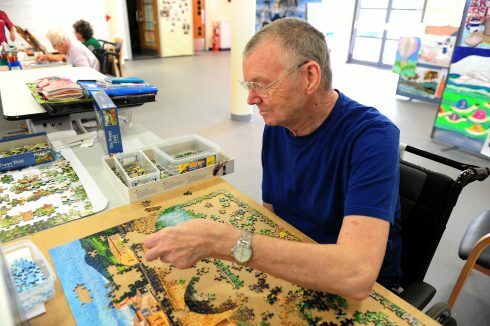 Our Social and Recreational department put together an array of daily activities which include music therapy, films, arts and crafts (stencilling, weaving, painting) and games (dominoes, quizzes, skittles), all of which are designed to care for residents’ emotional well-being and encourage participation and increase social inclusion. Set within a lively and enthusiastic environment, our Social and Recreational therapists provide the opportunity for residents to develop and express themselves through these activities. Other activities include a monthly darts match against the local Rotary Club, and making up doll’s houses to raffle off to raise money for Care for Veterans.